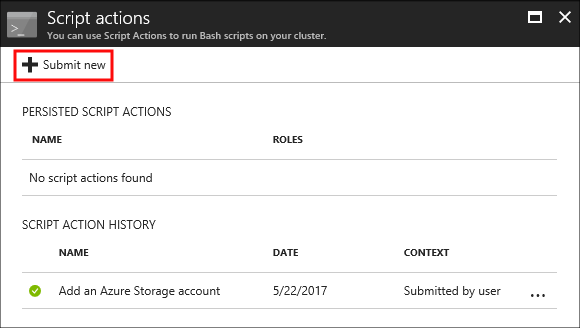 Azure HDInsight provides a configuration method called script actions that invokes custom scripts to customize the cluster. These scripts are used to install additional components and change configuration settings. Script actions can be used during or after cluster creation. Script actions can also be published to the Azure Marketplace as an HDInsight application. For more information on HDInsight applications, see Publish an HDInsight application in the Azure Marketplace. AMBARI.RUN_CUSTOM_COMMAND. The Ambari Administrator role has this permission by default. CLUSTER.RUN_CUSTOM_COMMAND. Both the HDInsight Cluster Administrator and Ambari Administrator have this permission by default. For more information on working with permissions with domain-joined HDInsight, see Manage HDInsight clusters with Enterprise Security Package. If you aren't the administrator or owner of your Azure subscription, your account must have at least Contributor access to the resource group that contains the HDInsight cluster. If you create an HDInsight cluster, someone with at least Contributor access to the Azure subscription must have previously registered the provider for HDInsight. Provider registration happens when a user with Contributor access to the subscription creates a resource for the first time on the subscription. It can also be done without creating a resource if you register a provider by using REST. An Azure Data Lake Storage account that's accessible by the HDInsight cluster. For information on using Azure Data Lake Storage with HDInsight, see Quickstart: Set up clusters in HDInsight. The URI format for scripts stored in Data Lake Storage Gen1 is adl://DATALAKESTOREACCOUNTNAME.azuredatalakestore.net/path_to_file. A blob in an Azure Storage account that's either the primary or additional storage account for the HDInsight cluster. HDInsight is granted access to both of these types of storage accounts during cluster creation. A public file-sharing service. Examples are Azure Blob, GitHub, OneDrive, and Dropbox. For example URIs, see Example script action scripts. HDInsight only supports Blob in Azure Storage accounts with a standard performance tier. Can be restricted to run on only certain node types. Examples are head nodes or worker nodes. Can be persisted or ad hoc. Persisted scripts are used to customize new worker nodes added to the cluster through scaling operations. A persisted script might also apply changes to another node type when scaling operations occur. An example is a head node. Persisted script actions must have a unique name. Ad hoc scripts aren't persisted. They aren't applied to worker nodes added to the cluster after the script has run. Then you can promote an ad hoc script to a persisted script or demote a persisted script to an ad hoc script. Script actions used during cluster creation are automatically persisted. Scripts that fail aren't persisted, even if you specifically indicate that they should be. Can accept parameters that are used by the script during execution. Run with root-level privileges on the cluster nodes. Can be used through the Azure portal, Azure PowerShell, the Azure classic CLI, or the HDInsight .NET SDK. The cluster keeps a history of all scripts that have been run. The history helps when you need to find the ID of a script for promotion or demotion operations. There's no automatic way to undo the changes made by a script action. Either manually reverse the changes or provide a script that reverses them. The script is automatically persisted. A failure in the script can cause the cluster creation process to fail. The script runs while HDInsight is being configured. The script runs in parallel on all the specified nodes in the cluster. It runs with root privileges on the nodes. You can perform operations like stopping and starting services, including Apache Hadoop-related services. If you stop services, make sure that the Ambari service and other Hadoop-related services are running before the script finishes. These services are required to successfully determine the health and state of the cluster while it's being created. During cluster creation, you can use many script actions at once. These scripts are invoked in the order in which they were specified. Script actions must finish within 60 minutes, or they time out. During cluster provisioning, the script runs concurrently with other setup and configuration processes. Competition for resources such as CPU time or network bandwidth might cause the script to take longer to finish than it does in your development environment. To minimize the time it takes to run the script, avoid tasks like downloading and compiling applications from the source. Precompile applications and store the binary in Azure Storage. A failure in a script run on an already running cluster doesn't automatically cause the cluster to change to a failed state. After a script finishes, the cluster should return to a running state. Even if the cluster has a running state, the failed script might have broken things. For example, a script might delete files needed by the cluster. Scripts actions run with root privileges. Make sure that you understand what a script does before you apply it to your cluster. If you change the cluster user, admin, password after the cluster is created, script actions run against this cluster might fail. If you have any persisted script actions that target worker nodes, these scripts might fail when you scale the cluster. 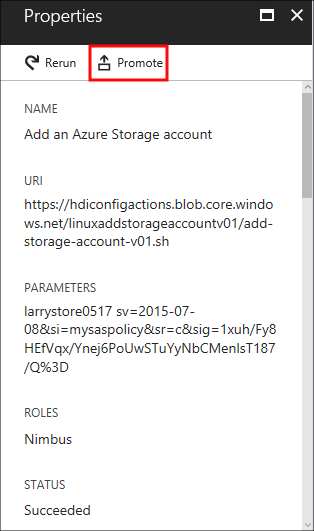 Add an Azure Storage account https://hdiconfigactions.blob.core.windows.net/linuxaddstorageaccountv01/add-storage-account-v01.sh. See Add additional storage accounts to HDInsight. Install Hue https://hdiconfigactions.blob.core.windows.net/linuxhueconfigactionv02/install-hue-uber-v02.sh. See Install and use Hue on HDInsight Hadoop clusters. Install Presto https://raw.githubusercontent.com/hdinsight/presto-hdinsight/master/installpresto.sh. See Install and use Presto on Hadoop-based HDInsight clusters. Install Giraph https://hdiconfigactions.blob.core.windows.net/linuxgiraphconfigactionv01/giraph-installer-v01.sh. See Install Apache Giraph on HDInsight Hadoop clusters. Preload Hive libraries https://hdiconfigactions.blob.core.windows.net/linuxsetupcustomhivelibsv01/setup-customhivelibs-v01.sh. See Add custom Apache Hive libraries when creating your HDInsight cluster. 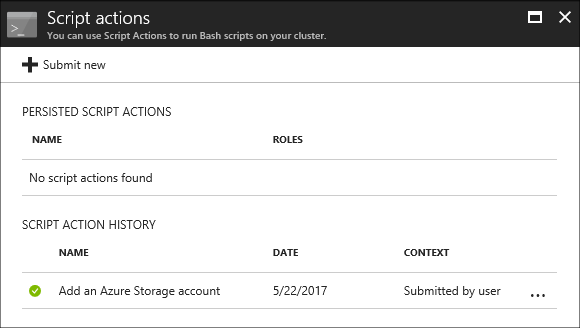 This section explains the different ways you can use script actions when you create an HDInsight cluster. Start to create a cluster as described in Set up clusters in HDInsight with Apache Hadoop, Apache Spark, Apache Kafka, and more. During cluster creation, you arrive at a Cluster summary page. From the Cluster summary page, select the edit link for Advanced settings. From the Advanced settings section, select Script actions. From the Script actions section, select + Submit new. Use the Select a script entry to select a premade script. To use a custom script, select Custom. Then provide the Name and Bash script URI for your script. Select a script To use your own script, select Custom. Otherwise, select one of the provided scripts. Name Specify a name for the script action. Bash script URI Specify the URI of the script. Head/Worker/Zookeeper Specify the nodes on which the script is run: Head, Worker, or ZooKeeper. Parameters Specify the parameters, if required by the script. Use the Persist this script action entry to make sure that the script is applied during scaling operations. Select Create to save the script. Then you can use + Submit new to add another script. When you're done adding scripts, select the Select button and then the Next button to return to the Cluster summary section. To create the cluster, select Create from the Cluster summary selection. Script actions can be used with Azure Resource Manager templates. For an example, see Create HDInsight Linux Cluster and run a script action. In this section, you use the Add-AzHDInsightScriptAction cmdlet to invoke scripts to customize a cluster. Before you start, make sure you install and configure Azure PowerShell. To use these PowerShell commands, you need the AZ Module. $sshCredential = Get-Credential -Message "Enter SSH user credentials"
# that it must run on. It can take several minutes before the cluster is created. The HDInsight .NET SDK provides client libraries that make it easier to work with HDInsight from a .NET application. For a code sample, see Create Linux-based clusters in HDInsight by using the .NET SDK. This section explains how to apply script actions to a running cluster. From the default view, under Settings, select Script actions. From the top of the Script actions page, select + Submit new. Select a script To use your own script, select custom. Otherwise, select a provided script. Use the Persist this script action entry to make sure the script is applied during scaling operations. Finally, select the Create button to apply the script to the cluster. To use these PowerShell commands, you need the AZ Module. $scriptActionName = Read-Host -Prompt "Enter the name of the script action"
$scriptActionUri = Read-Host -Prompt "Enter the URI of the script action"
Before you start, make sure you install and configure the Azure CLI. For more information, see Install the Azure classic CLI. If you omit parameters for this command, you're prompted for them. If the script you specify with -u accepts parameters, you can specify them by using the -p parameter. Valid node types are headnode, workernode, and zookeeper. If the script should be applied to several node types, specify the types separated by a semicolon ;. For example, -n headnode;workernode. To persist the script, add --persistOnSuccess. You can also persist the script later by using azure hdinsight script-action persisted set. See Cluster REST API in Azure HDInsight. For an example of using the .NET SDK to apply scripts to a cluster, see Apply a Script Action against a running Linux-based HDInsight cluster. A history of scripts for this cluster displays on the script actions section. This information includes a list of persisted scripts. The following screenshot shows that the Solr script has been run on this cluster. The screenshot doesn't show any persisted scripts. Select a script from the history to display the Properties section for this script. From the top of the screen, you can rerun the script or promote it. You can also select the ellipsis, ..., to the right of entries on the script actions section to perform actions. Get-AzHDInsightPersistedScriptAction Retrieve information on persisted script actions. Get-AzHDInsightScriptActionHistory Retrieve a history of script actions applied to the cluster or details for a specific script. Set-AzHDInsightPersistedScriptAction Promote an ad hoc script action to a persisted script action. Remove-AzHDInsightPersistedScriptAction Demote a persisted script action to an ad hoc action. Remove-AzHDInsightPersistedScriptAction doesn't undo the actions performed by a script. This cmdlet only removes the persisted flag. The following example script demonstrates using the cmdlets to promote and then demote a script. azure hdinsight script-action persisted list <clustername> Retrieve a list of persisted script actions. azure hdinsight script-action persisted show <clustername> <scriptname> Retrieve information on a specific persisted script action. azure hdinsight script-action history list <clustername> Retrieve a history of script actions applied to the cluster. 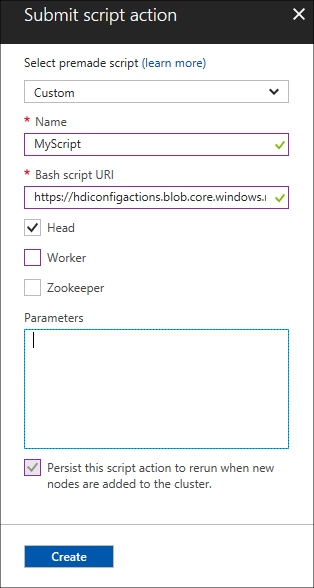 azure hdinsight script-action history show <clustername> <scriptname> Retrieve information on a specific script action. azure hdinsight script action persisted set <clustername> <scriptexecutionid> Promote an ad hoc script action to a persisted script action. azure hdinsight script-action persisted delete <clustername> <scriptname> Demote a persisted script action to an ad hoc action. azure hdinsight script-action persisted delete doesn't undo the actions performed by a script. This cmdlet only removes the persisted flag. For an example of using the .NET SDK to retrieve script history from a cluster, promote or demote scripts, see Apply a Script Action against a running Linux-based HDInsight cluster. This example also demonstrates how to install an HDInsight application by using the .NET SDK. The Microsoft Azure HDInsight service uses an ecosystem of open-source technologies formed around Apache Hadoop. Microsoft Azure provides a general level of support for open-source technologies. For more information, see the Support Scope section of Azure Support FAQs. The HDInsight service provides an additional level of support for built-in components. The Hive query language HiveQL. A full list of cluster components is available in What are the Apache Hadoop components and versions available with HDInsight? Custom components. As a user of the cluster, you can install or use in your workload any component available in the community or created by you. 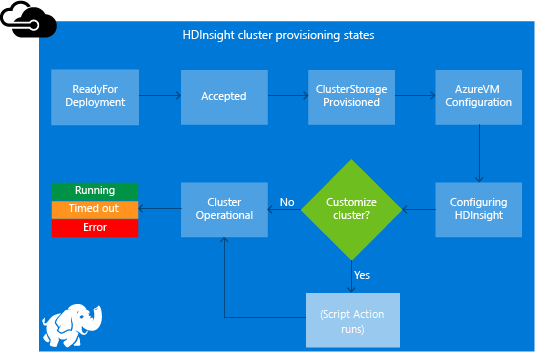 Components provided with the HDInsight cluster are fully supported. Microsoft Support helps to isolate and resolve issues related to these components. Custom components receive commercially reasonable support to help you further troubleshoot the issue. Microsoft Support might be able to resolve the issue. Or they might ask you to engage available channels for the open-source technologies where deep expertise for that technology is found. Many community sites can be used. Examples are MSDN forum for HDInsight and Stack Overflow. Job submission. Hadoop or other types of jobs that execute or use custom components can be submitted to the cluster. Cluster customization. During cluster creation, you can specify additional settings and custom components that are installed on the cluster nodes. Samples. For popular custom components, Microsoft and others might provide samples of how these components can be used on HDInsight clusters. These samples are provided without support. You can use the Ambari web UI to view information logged by script actions. If the script fails during cluster creation, the logs are also available in the default storage account associated with the cluster. This section provides information on how to retrieve the logs by using both these options. In your browser, go to https://CLUSTERNAME.azurehdinsight.net. Replace CLUSTERNAME with the name of your HDInsight cluster. When prompted, enter the admin account name, admin, and password for the cluster. You might have to reenter the admin credentials in a web form. From the bar at the top of the page, select the ops entry. A list displays current and previous operations done on the cluster through Ambari. Find the entries that have run_customscriptaction in the Operations column. These entries are created when the script actions run. To view the STDOUT and STDERR output, select the run\customscriptaction entry and drill down through the links. This output is generated when the script runs and might have useful information. If cluster creation fails because of a script error, the logs are kept in the cluster storage account. The storage logs are available at \STORAGE_ACCOUNT_NAME\DEFAULT_CONTAINER_NAME\custom-scriptaction-logs\CLUSTER_NAME\DATE. If you create a script action cluster with the same name on the same day, you can use the unique prefix to identify the relevant log files. If you create a cluster near 12:00 AM, midnight, it's possible that the log files span across two days. In that case, you see two different date folders for the same cluster. Uploading log files to the default container can take up to five minutes, especially for large clusters. So if you want to access the logs, you shouldn't immediately delete the cluster if a script action fails. Don't change the password for the Ambari watchdog, hdinsightwatchdog, on your Linux-based HDInsight cluster. Changing the password for this account breaks the ability to run new script actions on the HDInsight cluster. Cause. 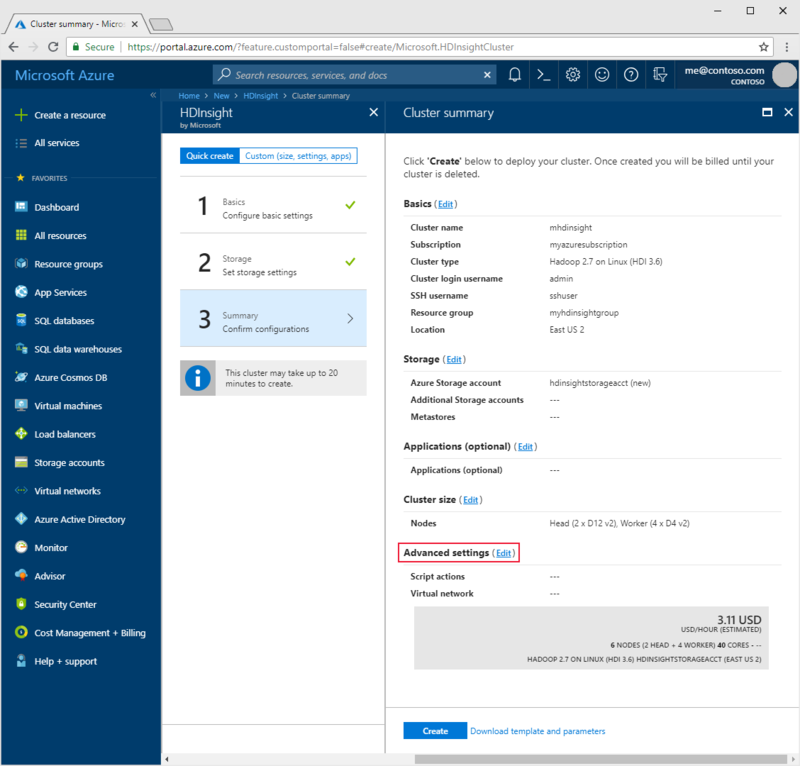 This error occurs if you upgrade the Python Azure Storage client that's included with the HDInsight cluster. HDInsight expects Azure Storage client 0.20.0. For information on connecting to the cluster with SSH, see Connect to HDInsight (Apache Hadoop) by using SSH. If your cluster was created before March 15, 2016, you might not see an entry in script action history. Resizing the cluster causes the scripts to appear in script action history. Your cluster was created before September 1, 2015. This date is when script actions were introduced. Any cluster created before this date couldn't have used script actions for cluster creation. No new script actions can be run on this cluster because of conflicting script names in existing scripts. Script names provided at cluster creation must be all unique. Existing scripts are run on resize.